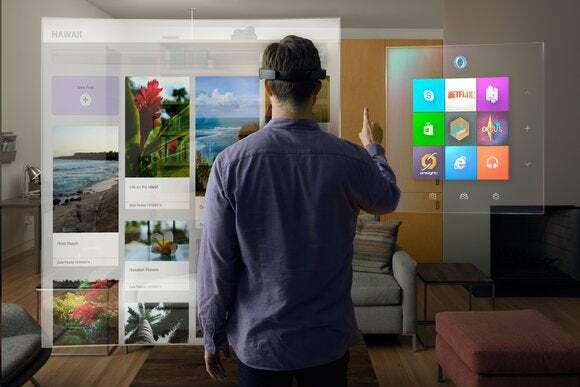 "We're dreaming about holograms," said Alex Kipman of Microsoft, as he unveiled a new set of technologies that will bring 3D imaging and augmented reality to Windows. 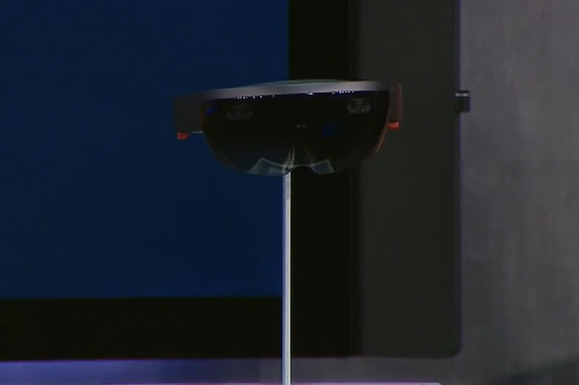 That's right: holograms—possibly the biggest surprise from Wednesday's the Windows 10 consumer preview unveiling. Microsoft is building augmented reality into Windows using Windows Holographic and the Microsoft HoloLens, a headset for viewing 3D images. It's actually three technologies that will work together: Windows Holographic, which will enable 3D imaging in all future builds of Windows 10. Windows HoloLens, a headset for viewing and interacting with 3D images. And finally, the HoloStudio application will let you make your own holograms. Microsoft Windows Holographic and the HoloLens headset will enable 3D gaming, like this demo of Minecraft played on an entire living room floor. 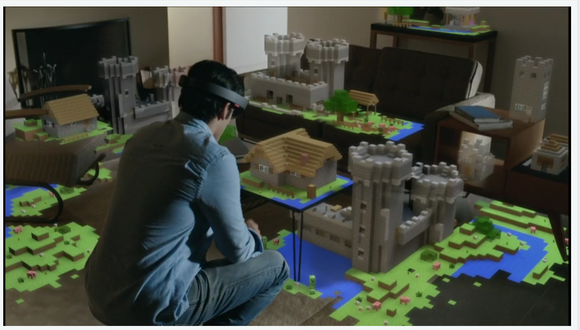 Microsoft teased the possibilities in a video: a HoloLens-wearing man played a 3D version of Minecraft. A HoloLens-wearing woman walking through an office, talking to a colleague on an image floating in front of her. Another user walked within a planetary scene. In a more everyday context, the weather report popped up on a family room rug, with 3D imaging augmenting the data. 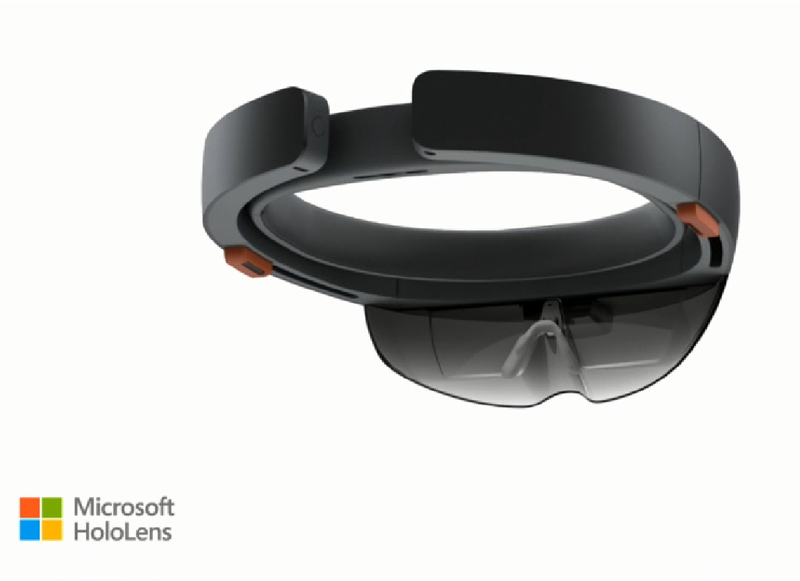 The Microsoft HoloLens is a headset that will be used with Windows Holographic to see and interact with 3D images. "It will understand your gestures and voice," Kipman promised, "and spatially map the entire world around us." And unlike AR solutions we've seen up to now, the HoloLens will not need markers, external cameras, or a tethered phone or a PC to help it process the data—"terabytes of information from all of these sensors, all in real time," he described. 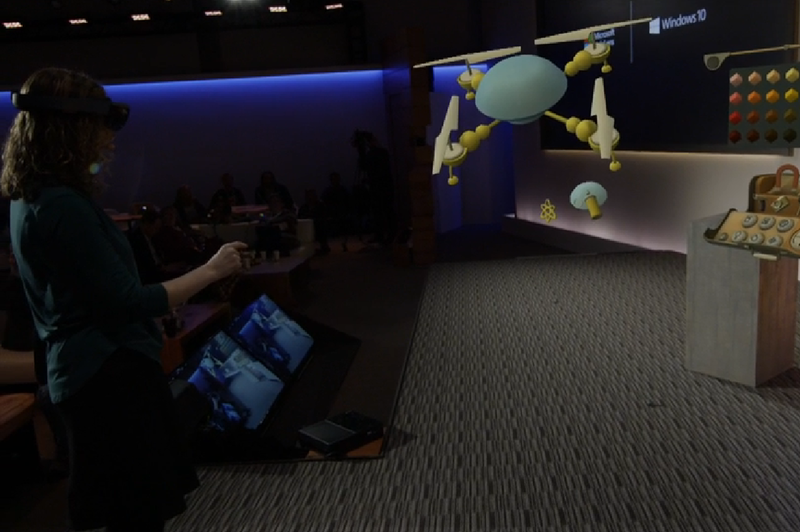 In this demo of Windows Holographic and the HoloLens headset, the user picks elements from a 3D "toolbox" to make a 3D flying robot, all in the air in front of her. For the real-time demo of Windows Holographic and the HoloLens, a woman built a flying robot using a 3D "toolbox" that floated in her field of vision along with the object itself. She could pick items from the toolbox and apply them to the hologram, and move the hologram as she examined her work. Windows 10 may still be in preview, but adding holograms, 3D imaging, and augmented reality to the operating system pushes Windows way ahead of Mac OS X and Chrome OS, changing how people use computers in their daily lives. Stay tuned for our hands-on from the event.